# Combine the sake, soy sauce, mirin and sugar in a medium saucepan over medium heat. Bring to a simmer. Cook, stirring occasionally, for 2-3 minutes or until sauce thickens slightly. Remove from heat and set aside to cool. # Combine the chicken and half the sauce in a bowl. Season with ground white pepper. Place in the fridge for 30 minutes. 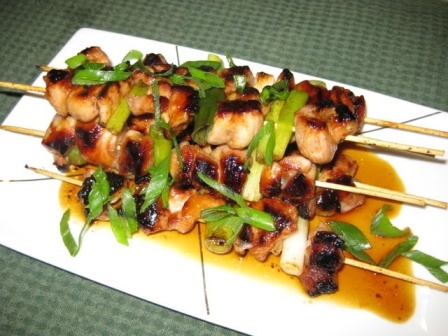 # Thread the chicken and green onion alternately onto skewers. Heat the oil in a large frying pan over medium heat. Add the skewers to the pan and cook for 6 minutes or until cooked through. # Transfer to a platter and sprinkle with extra green onion. Serve immediately with the remaining sauce.